As the autumn leaves fall upon us, fresh fall air and the changing of colours signifies the start of a long-standing tradition that comes with this season: Thanksgiving. While you’re craving stuffed turkey, gravy and mashed sweet potatoes (don’t forget the cranberry sauce), remember to give thanks to your family and loved ones as you gather around the table to feast on your family’s favourite recipes. According to Global News, Thanksgiving has been celebrated in Canada since 1578 – that’s over 438 years – thanks to Martin Frobisher, an English explorer that wanted to show his gratitude for arriving safely in Newfoundland after his journey to North America from Great Britain. Below are some more Thanksgiving Trivia bits to share at your family gathering this year. Is turkey putting you in a food coma? Studies show carbs are the culprit rather than the traditionally accused tryptophan. B.C. is a province known for its production of cranberries – landing themselves on your kitchen table for the colder months when they’re in season and being added to sweet sauces and preservatives. Did you know that pumpkin pie could be found on dinner tables as early as 1650? How’s that for retro recipes? Our obsession with pumpkin surely isn’t a new fad. For more Thanksgiving trivia tidbits click here . If cooking is a family tradition and pumpkin isn’t your favourite fall gourd, spice up things in the kitchen this Thanksgiving with a butternut squash recipe from Canadian Family that’ll be sure to impress those at your gathering. Plus, it’s a great way to get all family members involved in the preparation to build new memories of fond times spent together. For more autumn-inspired recipes, see the full list courtesy of Canadian Family here. For more thanksgiving ideas and explanation on how to carry out each of the activities above, click here. 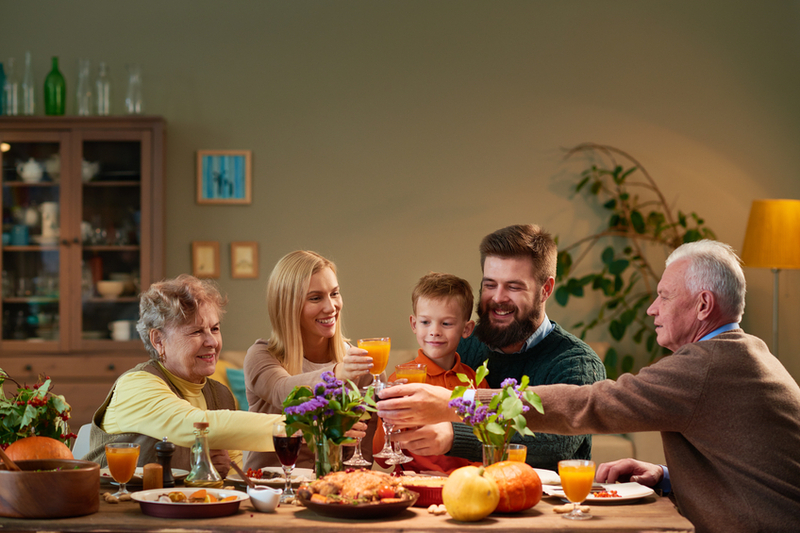 Family gatherings like thanksgiving are a time to socialize with loved ones and catch up on all the things they have missed since you last saw them.Aside from the occasional dance recital and new job announcement you may have missed, other changes are bound to have happened. If you have elderly loved ones in your family, they may have started showing signs of aging such as difficulties carrying out some of their daily tasks including personal care and hygiene, remembering to take medication or even eating healthy meals. As a daughter or son of your aging parents you may suddenly realize the additional help they require including more time and involvement from you. If you are unsure about them needing help, use the basic checklist here as a guideline to help you decide. One of the most common signs of aging is memory loss for example do you bake warm pumpkin pie together every year, but Mom can no longer open the can of pumpkin pie filling? Has Dad forgotten to add the cranberries to the homemade stuffing, even though they’re his favourite part of the dish? Whatever the tradition may be, it is important to reinforce these yearly occurrences as a means to bring your loved ones closer together. As our loved ones get older, it is important to be thankful for the time we spend together, and give thanks to those who enhance our well-being and quality of life: family, friends and loved ones. For the times you can’t be with your aging parents, our Bayshore caregivers can help. They’re grateful to provide a helping hand in the comfort of the client’s home. Respite care options are available for family caregivers, and at home care solutions for those not present. Happy Thanksgiving to you and your family!